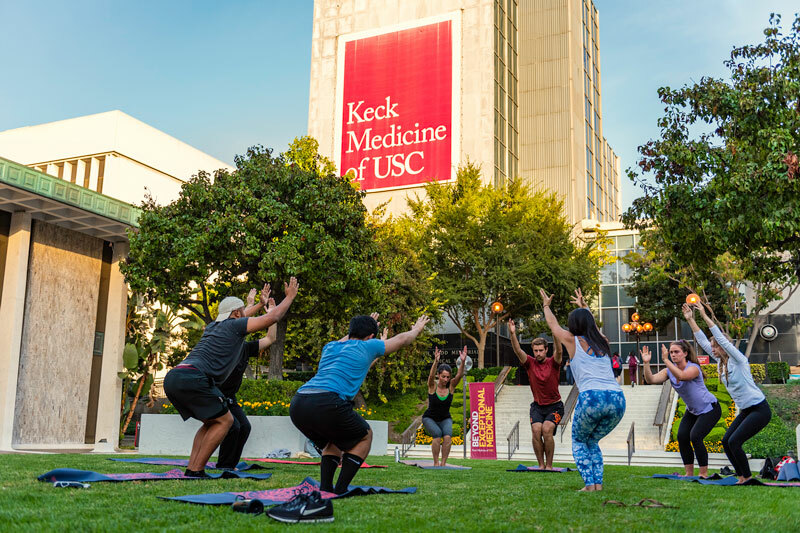 Amid growing awareness of suicide and depression among health professionals nationwide, new wellness programs at Keck Medicine of USC ensure students and doctors care for themselves. After decades of punishing schedules and high-pressure exams, medical schools across the nation are awakening to the need for major changes in how doctors are trained — and USC is leading this charge on physician wellness. Because medical students are expected to spend long hours in the hospital and master overwhelming amounts of information, many suffer from stress, anxiety and depression, according to national studies. Some even consider suicide. The pressure can continue and even worsen as students become residents, then attending physicians. Laura Mosqueda MD ’87 recalls spending every third night on call as a resident, staying awake for 36 hours and barely getting a full night’s sleep before beginning the cycle again. She regularly encountered a prevalent “I did it, now you’re going to do it” mentality among older physicians. Today, USC leaders are both changing the culture of medical education and promoting wellness among USC medical professionals who care for others. 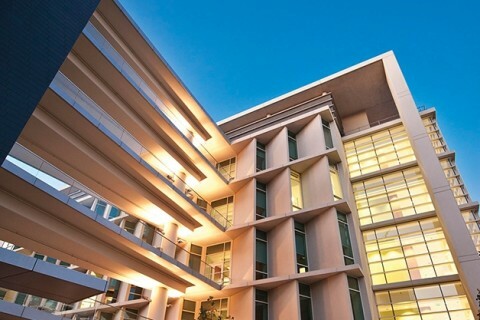 The idea is to instill health and well-being among residents, faculty physicians, nurses and other staff members across the entire medical enterprise of Keck Medicine of USC. It starts in medical school with new programs like mandatory informal check-ins with a psychologist for all first-year students. Students also take regular surveys that help detect stress, anxiety and depression. Classes in mindfulness and yoga offer a brief respite from students’ hectic lives. The school promotes healthy food options and exercise, as well. Efforts continue into residency training and practice. Residents, faculty physicians and staff members can talk through difficult experiences during debrief sessions. Health professionals also are learning to identify danger signs among their peers. At the heart of this strengthened focus on wellness throughout USC’s medical ranks is growing recognition of serious mental health problems affecting all health care providers. A sweeping analysis of studies on the mental health of medical students worldwide found that 27 percent report depression or depressive symptoms and 11 percent report suicidal ideation — much higher than rates in the general public. Equally concerning is the lack of treatment. Only 15 percent of medical students who screen positive for depression seek psychiatric help. Those concerns persist among practicing physicians. With an average of one death by suicide each day, U.S. doctors have the highest suicide rate of any profession. Many of those deaths are linked to work-related burnout and untreated depression. Awareness of mental health challenges in medicine reached a tipping point around 2015, Opas said, inspiring a gathering of the Accreditation Council for Graduate Medical Education solely focused on wellness. Council members rewrote national medical school requirements to mandate wellness programming as part of every future doctor’s education. Attendees also pledged to promote health and well-being in their own programs. Keck Medicine of USC had already started developing its wellness initiative a year earlier, and Opas built on those efforts by securing a three-year grant from the UniHealth Foundation to bring in Fishel as director of residency wellness. In addition to meeting one on one with residents to discuss challenges in their work and personal lives, Fishel conducts mental health surveys, holds relationship workshops with residents and their spouses, and offers monthly classes on mindfulness in medicine that are open to students, doctors, nurses and staff members. As part of a program started at USC — Helping Healers Heal — she trains health care providers to watch for signs of stress and depression among colleagues. 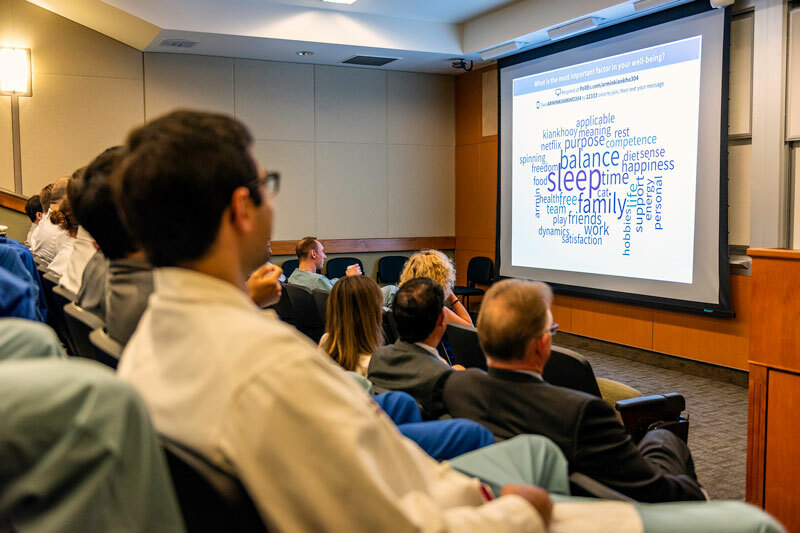 Another effort, known as Schwartz Rounds, brings together USC doctors, nurses and other professionals to share their reactions and emotions in a group setting after difficult cases. Opas plans to expand those offerings and envisions hiring more staff members to focus on wellness. Third-year Keck School of Medicine student Amy Jahr needs no convincing to embrace wellness. The trained yoga instructor has held informal yoga sessions with other students and joined in various student-led wellness programs, so she is excited to see USC emphasize well-being across its medical facilities and launch dozens of new wellness resources for medical students. She is especially encouraged by the openness to change in medical education. When students pointed out that a high-stakes exam was scheduled too soon after another test, causing them significant anxiety, school officials changed the requirements to reduce that stress. Now the test is treated as a refresher after their first year, rather than a must-pass exam. Jahr also applauded a new initiative that provides an extra — and mandatory — day off for students every six weeks. As a third-year student, she is in the midst of a difficult stretch in her training. For the next 12 months, she will complete seven rotations in various medical departments. Just as she gets comfortable in one setting, she’ll move on to the next. Some clerkships like psychiatry will have schedules similar to the typical workday, she said, but others like surgery will involve 30-hour stretches at the hospital. Jahr is grateful to have a bonus wellness day during each rotation, giving her a chance to run personal errands or relax. “It’s about having that protected time to not be thinking about medical school, not be studying or worrying about how your research is going — to just be a living, breathing human,” she said. Finding those pockets of free time will only become more difficult as students graduate and move into residency, when they’ll receive intense and specialized training in their area of focus under the scrutiny of supervising physicians. Residency typically involves punishing schedules. Guidelines revised in 2013 eliminated 100- to 120-hour work weeks for medical residents, but these physicians are still expected to spend up to 80 hours a week on the job. Kiankhooy learned that lesson the hard way during his residency. Initially, he was doing well on exams and even receiving awards. Then he hit a rough patch in a relationship, turning his world upside down. Because he had been focused on his job, he didn’t realize his life outside the hospital was empty. He had no work-life balance or a healthy way to cope with stress. “My hand was forced to start building these systems around me,” he said. Now Kiankhooy co-chairs a residency wellness committee and meets regularly with surgical interns at USC. He ensures they know how to get help in times of need. He encourages them to find time, even if just a few moments, to take a walk outside or find a quiet space to practice mindfulness. His door is always open to those who need a break. “My office is a sanctuary if they ever want to come disappear for a few moments,” he said. Without adequate coping skills and a strong support system, one additional stressor like witnessing a child’s death or having relationship challenges at home can throw everything off balance for residents. Alexis Gordon knows that all too well. She had been fixated on her training in pediatrics and medicine as a first-year resident at Los Angeles County+USC Medical Center. Then a close family member was diagnosed with cancer. Anxious about the situation, Gordon struggled to focus at work. She also had to find time to help with household chores, provide support and companionship during chemotherapy appointments and keep the fridge stocked. Feeling overwhelmed, she reached out to Fishel, USC’s director of residency wellness. They talked through some of her challenges and developed strategies like short meditation sessions and breathing exercises to counteract stress. The experience changed Gordon’s approach to providing care. Now a third-year resident at LAC+USC, she shares those wellness techniques with her patients and their family members. It has helped her view each client as a person with fears and stress and struggles to overcome — not as another case to be diagnosed and treated. It is disappointing and frustrating that we as health professionals have gotten to the point that we are so unhealthy. I really hope that we can start working on taking care of ourselves and seeing that as just as important as taking care of our patients. She now encourages her fellow residents to check out the Keck School of Medicine’s wellness programs and prioritize their personal well-being. Although it can be challenging to set aside even a few minutes each day, Gordon said, taking a quick break from the daily grind of residency can make a big difference. “I hope this encourages people to continue to be introspective and realize when wellness is being ignored within themselves or their program,” she said. 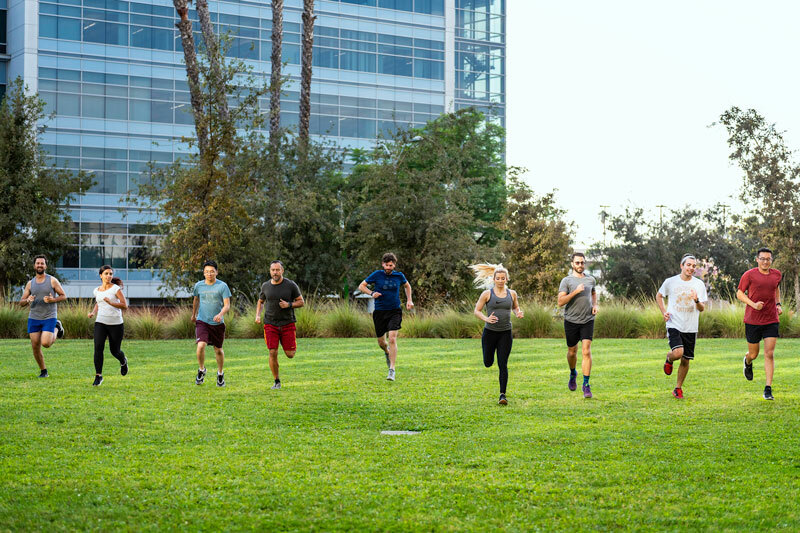 As medical schools across the nation begin promoting wellness among students and residents, USC leaders are emphasizing the message with other groups on campus, like staff members and faculty physicians. Mosqueda recently named a new associate dean for leadership and wellness and emphasized that more programs focused on faculty and staff members are being launched. Eliminating the “tough it out” mentality among some faculty members will be a challenge, said Ramin Tabatabai, assistant professor of clinical emergency medicine at USC. “In contrast to the traditional definition of toughness in medicine where we never acknowledge our personal challenges, we can demonstrate our toughness by acknowledging when we ourselves are struggling rather than internalizing our struggles and isolating ourselves,” he said. That can be difficult, especially for senior physicians who might feel uncomfortable appearing vulnerable or admitting mistakes to their colleagues or junior doctors. “Any time you don’t immediately know an answer or how to take care of a patient, rather than admitting you don’t know, there’s a culture of posturing where everybody pretends they know the right answer,” Tabatabai said. As director of the emergency medicine residency program at LAC+USC, Tabatabai encourages residents and attending physicians to discuss their challenges openly. He has found that peer-led debrief sessions are particularly helpful in creating a supportive environment. He is hopeful LAC+USC’s new focus on wellness can prevent tragedies like one he experienced in 2011. While working in an emergency medicine department in San Francisco, Tabatabai and his colleagues became concerned when a close friend didn’t show up to his shift. They later learned he had jumped from a bridge and died, the apparent result of a hidden struggle with depression and bipolar disorder. So when Tabatabai returned to LAC+USC, where he completed his residency, he was on high alert for any indications of burnout, mental health struggles or other issues among his colleagues. USC’s physician wellness advocates know there is still plenty of work to do, but they are optimistic as awareness starts to spread. They see signs that the culture is changing across the medical campus. One meaningful moment came after the death of a young boy who had been receiving care in the pediatric intensive care unit for months. The loss affected many health care workers who had cared for the child, and hospital leaders organized a group session to acknowledge the painful event. During the gathering, someone mentioned that just a few years prior, that kind of open discussion would never have happened. Laura Mosqueda was once a student at USC’s medical school. 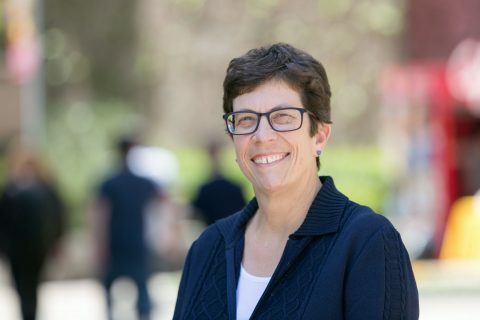 Now, as dean of the Keck School of Medicine of USC, she sees an evolution in how to teach future doctors. Health care is in growth mode across Southern California, and USC has staked its future on academic medicine. 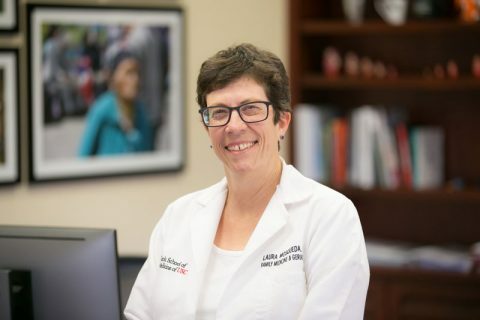 Laura Mosqueda fights for social justice and cares for vulnerable populations as she leads the Keck School of Medicine of USC into a new era.